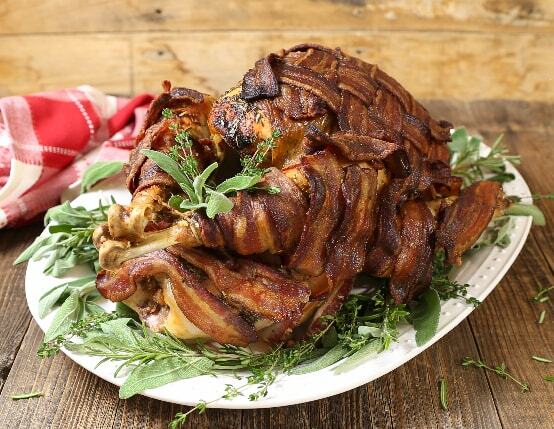 Say goodbye to brining - wrap your holiday turkey in a blanket of bacon to create a show-stopping centerpiece. This bacon-wrapped turkey is the ultimate indulgence. Take turkey out of refrigerator about 30 minutes to 1 hour before roasting. Prepare turkey by removing neck and giblets. Wash turkey inside and out in cold water; check for and remove any pin feathers. Pat entire turkey dry with paper towels. Set turkey on rack in large roasting pan. Tuck wings under turkey so they do not burn. Set aside. In small bowl, use a fork to combine butter, garlic, rosemary, sage, thyme, salt and pepper. Starting at cavity opening, carefully slide hand under skin to separate skin from breast. Work hand as far up to the neck as possible, being careful not to tear skin. Add about 1/3 of butter mixture under skin then rub turkey on top of skin to massage butter around under skin. Coat turkey with remaining herb butter, being sure to get a good coating to help hold bacon in place. One slice at a time, begin wrapping turkey in bacon. To help, pull bacon first to stretch it out just a little. Starting with drumsticks, begin at small end and carefully wrap bacon around, making sure to note wrap too tightly so it does not pull away when it cooks. Start next piece where last piece left off, overlapping a little to help pieces stay together. Wrap bacon over wings, then tie legs together with kitchen twine. To cover turkey breast, on a piece of parchment paper, vertically lay out 6 pieces of bacon next to each other, touching but not overlapping, to create a rectangle. Gently pull ends of bacon to stretch it out a little, without tearing it. Place a piece of bacon horizontally across rectangle, tuck it under the first slice, over the second, under the third and so on until it is woven under every other slice. 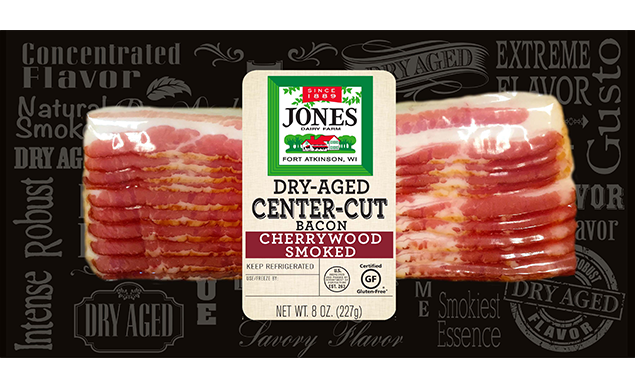 Continue to gently tug at bacon to stretch it as you go. Repeat with remaining slices of bacon, alternating each slice until there is a tight square. Align bacon square so it will lay over turkey breast in a triangle. Flip parchment paper over turkey breast to lay bacon on top; adjust as necessary for full coverage. Pour water into pan. Bake for 20 minutes to crisp bacon. Reduce oven to 325°F and continue baking for 2-2 1/2 hours or until internal temperature in thickest part of thigh reads 165°F or more. Allow turkey to rest for 15-30 minutes before carving it. To carve, run knife in sawing motion to cut bacon first and then slice turkey. Or remove bacon from turkey and serve together. Serve and enjoy! To make the best gravy, use drippings. It will create a bacon herb gravy. Defrosting turkey in refrigerator takes about 5 hours per pound, or about 3 days for a 12-14 pound turkey. Before you put turkey in oven, make sure you have added water and tucked the wings.